As observed in Part 1 of this analysis, corruption is the vehicle on which politics of poverty rides all over Kenya. 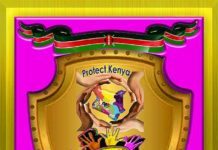 Numerous surveys and opinion polls have shown that Kenyan youths admire corruption and consider it as their key to luxurious life. They are willing to pay and to accept corruption money to fulfil that dream. 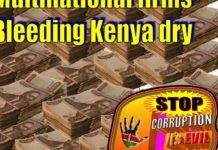 This article explains how corruption became a shameful way of life in Kenya. Corruption exploded in Kenya during President Mzee Jomo Kenyatta mid-term of his 16 years reign after a 1971 recommendation by then Head of Civil Service and Secretary to the Cabinet Duncan Ndegwa commission allowing civil servants to engage in business. Ndegwa’s recommendation was founded on the premise that civil servants would guard against conflict of interest in choosing the businesses they engage in. However, it turned out that the public officers had been given a blank cheque to enrich themselves, their wives, sons and daughters as well as relatives. Only a year or so earlier disgruntled police officers had sought better terms of service and expressed desire for better pay and Kenyatta had told them to use the power of their crown to make ends meet. Rather than improve their service delivery expecting better appreciation, the police took Kenyatta’s advice to mean they use their crown to extort bribes from lawbreakers. The traffic police, whose vetting has revealed how easily they made millions of shillings, took the advice to extreme extent they would never expect as retirement benefit for 30 years’ service, to be millionaires in as short period as a year. Politicians took a cue from the public service and placed high premium on politics as the best non-professional paying career in Kenya by demonstrating sycophancy and blind loyalty to the president in power. During the Moi era cabinet ministers and their cronies were rewarded with duty free importation of merchandise of their choice opening floodgates for cheap counterfeit products from the Far East nations of Asia on Kenyan market. Most of the products led to the closure of Kenyan factories put under financial strain by foreign exchange shortages and World Bank dictated liberalisation towards a free market economy. Sycophancy reigned supreme. The materially and intellectually well endowed Kiambu, where Kanu was born, had a semi-illiterate motor mechanic Kuria Kanyingi waving its political banner as the ruling party district chairman praying that he would like his life on earth cut short and whatever more years he would have lived to be added to President Moi. His extraordinary myopic prayers were heard and answered in November 2014 as he passed on at the age of 71 years, leaving Moi to soldier on past the age of 90 years. Kanyingi had also announced if he was cut, blood flowing from his veins would be Kanu – giving birth to “Kanu damu” phrase by sycophants henceforth. During the Moi era, every senior civil servant and politician had learned to pay special attention to the One o’clock news on sole State broadcaster Voice of Kenya/Kenya Broadcasting Corporation to learn whether he or she had been sacked or demoted. They had pocket-size transistor radios to listen to the news. Some ministers who skipped the news bulletin presiding over a function would find their drivers having removed the ministerial flag from the official vehicle. The drivers would be waiting for them to find out whether they wanted to be given a lift or where they would be dropped since they were no longer ministers. 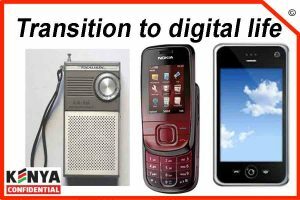 There were no mobile phones or internet twitter and faceBook platforms. At one time during an interview with Joseph Nyagah, then managing director at Kenya Airways, he interrupted me to listed to one O’clock news from a small radio he had inside his desk top drawer. The senior personnel would also not miss most of Moi’s public rallies, where he used to hire, fire or promote civil servants in the course of off-the-cuff remarks in Kiswahili after reading prepared speeches in English. Among other things, this meant that the Presidential jukwaa (dais) or other VIP enclosures where he presided, including at Agricultural Society of Kenya (ASK) shows and fairs, was packed to the rafters wherever he went. This also meant that Cabinet ministers, their assistants, permanent secretaries, provincial administrators, police and military top brass were away from their offices and posts in large numbers several times a week, more than 45 weeks a year. When Moi travelled on intercontinental official and State visits, for instance to China, India, South Korea, Brunei and Australia he took joy riders by the planeload including the defunct supersonic British-French Concorde, again senior officials who ought to have been running the entire machinery of government. During the Australian trip to the Commonwealth meeting presidential guard police sneaked in the country with guns that they were required to deposit with host security armoury. They were disarmed on hotel staircases where they were found in a slumber dead drunk at night. 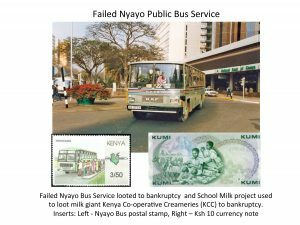 Old habits die hard and the Moi era extravagancy in foreign trips still remains the order of the day in Parliament, the Senate and County Assemblies, many of them dominated by beneficiaries of free Nyayo Milk when in primary schools, which bankrupted the Kenya Creameries Co-operative (KCC). Beyond politics Kenyans recently witnessed the debacle of professional behaviour by the National Olympic Committee (NOC) that flew 94 officials to accompany 87 athletes to the Rio Olympics. Other joyriders to Rio included excess bodyguards, personal assistants and lovers. Even athletes uniforms were stolen by well paid NOC officials intended to be sold as mitumba at Gikomba and NOC officials sports shops. To enhance blind loyalty by mid 1990s the civil servants no longer had their job tenure as envisaged in the Public Service Commission (PSC), but were at the mercy of a powerful political machine and a paranoid, manipulative leader with a very long political memory and backlog of grudges indeed. Kleptocracy sank deep into governance and public servants were promoted or demoted depending on bribes they collected in extremely abused “harambee” extortion schemes. So long as the senior civil servants were at the mercy of the ruling political elite, professionalism took the backseat while many of them sought to loot public coffers the most they could while the sun shone. 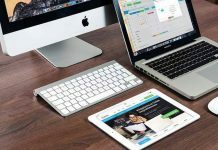 The speed at which business licenses were processed, the pace at which public projects were implemented and the rate at which payments for goods and services was made, depended on the size and frequency of bribes paid. Towards the beginning of the government financial year finance ministers would invite contractors owed tens and hundreds of millions and agree on a 10-20 per cent commission on amounts to be paid in the new fiscal year. The contractors would sign cheques for the amount agreed payable to the ministers, their firms or cronies to be encashed as soon as government cheques were paid. The payment of such bribes were taken to higher levels by Chris Okemo when he was finance minister for foreign contractors to deposit the bribes in foreign accounts. His bribes were deposited in offshore account in British Jersey. 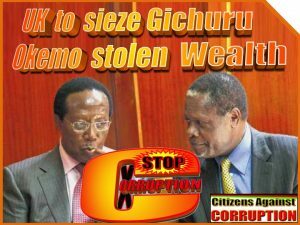 Okemo and former Managing Director of the Kenya Power and Lighting Company Samuel Gichuru successfully managed to deposit close to a billion shillings in Jersey. But at the same time they earned themselves 56 corruption and money laundering charges that brought about extradition dispute they are fighting in court today. The amount of disgrace and loss of dignity associated to corruption is great and getting worse globally. To a large extent corruption eventually does not pay as an old age benefit. 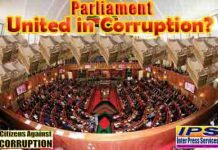 Corruption was therefore entrenched by politicians and compactly super-glued within the Civil Service that offered “signatures for sale” to endorse contracts, payment vouchers and cheques. 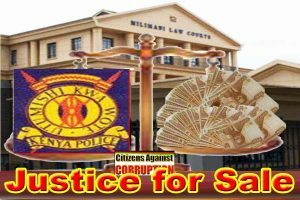 A corrupt judiciary offering “Justice for Sale” protected the criminal cartels. 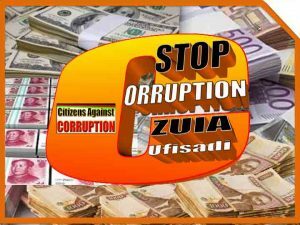 Corruption became a religious cult among officials and a way of life in which government tenders and contracts were loaded with as much as 30 or more per cent cost as bribes to procurement officers and their cartels. Convolution led to higher charges for public projects to enrich civil servants and political brokers who offered “signatures for sale”. There were “harambee” receipt books in every government office for all manner of fake Nyayo “projects”. Even the bodyguards, drivers, aides and secretaries of all-powerful ministers and power-brokers would always have a harambee receipt book in their pockets, handbags, car glove compartments, or office drawers, including at security desks located immediately outside the doors of VIP lifts. Sometimes these graft-riddled functionaries would collect donations in their own bosses’ VIP waiting rooms from guests anxiously waiting to see their masters. The judiciary took the cue from the two other arms of government and openly operated what became ‘justice on sale’ supermarket on the corridors of justice and judicial chambers. The judiciary was aided by the legal profession that saw advocates, senior or junior, become conduits of millions of corruption cash to magistrates and judges without any remorse. Advocates firms became the safe havens to hide corruption proceeds in the name of clients’ accounts. Unsurprisingly, a large number of kleptomaniacs and incompetents in politics, civil service and judiciary were rewarded through promotions and better jobs while services to wananchi deteriorated and fuelled poverty and mass suffering. Lethargy is public service delivery set in as mortis rigor would set in a dead body that no mortician could revive. Both the civil service and judiciary became notorious mortuaries of failed public projects, baptised “white elephants” and pending cases along with judgements whose files were either hidden or “lost” in judicial registries. A remarkable national predicament prevailed across the nation, in which the worst elements of society, like proverbial scum, floated to the top. This was the rule of the least fit, least qualified and least able, practically formed dictatorship of village idiots. In many ways, it was often as bad as the colonial experience, humiliating, stultifying and deadening. Where the colonialist assured Kenyans that they were lesser beings ranked after all other races and mixtures of races, somewhere between beloved household pets and livestock, the Moi kleptocracy sneered at Kenyans and cautioned them not to be what it called “Wajuaji” (too clever by half). By deliberately depriving people of much-needed services, the Moi government thus imitated his colonial predecessors. 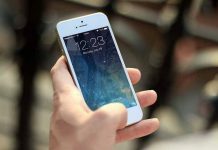 One may agree with the observation that poverty is a capability failure or the failure of basic capabilities to reach certain acceptable levels. However, the main concern is not so much the capability failure itself as how that manufactured lapse came about or was engineered. The lethargic nuisanse from which public services suffers to date. When it is deliberately induced by strong forces such as the government and the international community, such a depredation becomes poverty creation. In the process, these forces obstruct the desire and willingness of a people to convert resources into wealth in terms of goods and services. That is the experience Machakos governor Alfred Mutua went through after negotiating potential investment deals in excess of Ksh 3 trillion three years ago that have never seen fruition. The choice to act or not to act for the improvement of society is thwarted by the political forces that want to deny citizens of their freedoms and rights. Poverty creation, therefore, implies denial of fundamental freedoms and rights of citizenship. During Kenyatta and Moi regimes, it was a treasonable crime to imagine the death of a president. It was a crime known as sedition to expose bad governance and corruption in high offices. Taking away the freedoms of the people to be innovative, to invest, to improve their quality of life, and to demand accountability and participate fully in the governance of their countries are some of the ways in which African governments have made Africans poor. They have created poverty. They did this partly because they had learned well from the colonialists not to trust their own people and as such go out of their way to destroy anyone who might appear to be doing well. While yearning to attract foreign investors or multinationals, African governments went out of their way to discourage domestic capital accumulation and investment because of the political unease, always bordering on paranoia, they felt about the emergence of a nationalist capitalist class and genuine doubts that such a class could assume the leading role of industrialization. What was more, the authoritarian thrust of African politics sought to block the emergence of alternative sources of political power. This mix of paranoia, inferiority complex and brutalism produced a brand of misrule that remains peculiarly African, different from the totalitarianisms of communism and fascism in Europe and only akin to South American and some Asian despotism. This explains the single-party grip on Kenya politics, the brutal clampdown on dissenting voices, even within the Cabinet, and detentions without trial. It was therefore not by accident or ill economic tide that enterprising Kenyans were deprived the utility of their toil and forced to close shop by government-controlled banks. Indeed, some were determined to challenge the political forces and they set out to initiate their own banks, but they too were shut down. 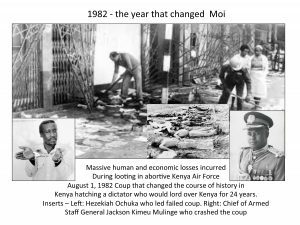 Not trusting, and fearing, his own people, Moi, after the 1982 abortive coup, entered into a retrogressive and destructive spree. Mainstream productive areas of the national economy in terms of coffee, tea, cotton, sugar and the dairy industry were systematically destroyed to impoverish populations he suspected threatened his grip on power. The control mechanisms through a colonial-type bureaucracy ensured that the best efforts to convert resources into wealth were thwarted through requiring special permits and licenses which then became a new form of fleecing the public as corruption, known as chai or kitu kidogo (tea or a small token, a euphemism for bribery), to obtain permits became a norm. The bribery fees demanded of citizens and the time lost in the process before they could be allowed to improve their lives, during the Moi era, made wealth creation extremely difficult. Enterprising Kenyans did not give in and opened up Jua Kali businesses to keep their heads above the water while demanding good governance. In apparent desperation, Moi created more poverty by mounting wars on his own people in the hope that the leaders could stave off popular demands for change. Violence was generated in the form of so-called land clashes, ethnic clashes, and cattle rustling. 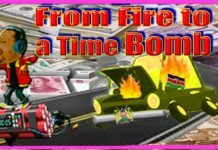 Whatever the terminology, the end result of this low-intensity terrorism before which all policing agencies appeared to be ineffective was intended the creation of ever more poverty for Kenyans. Easily the most abominable thing about the Nyayo kleptocracy was that it surrounded itself not merely with a bodyguard of lies but of impoverishment – it felt safest and most-in-control in a sea of national want and helplessness. 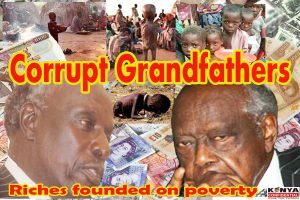 And as Moi Politics of Poverty Master Architect, created ever more poverty, he begged the international community forever more help and assistance but was eventually denied. 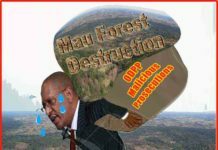 Domestic and external political pressure finally forced Moi to abandon Kanu’s repressive single-party rule. Thereafter he went around the country telling Kenyans that multiparty politics would breed ethnic hostilities. One need not look very far to see the root cause of recurrent ethnic clashes during elections in 1992, 1997 (only taking a break in the 2002 poll in which he was not a contender) and the bloodbath during and after the 2007 elections – triggered by Raila Amolo Odinga’s Mass Action. It follows then that the reason some people go out of their way to create poverty is political, because poverty is a controlling mechanism. This was the case with the imposition of colonialism in Africa in which the alien conquerors often created famine as a method of control. Those who resisted colonialism had to be made poor and all the resources available to colonial authorities, including missionaries and diseases, were deployed to impoverish the African. Since there were times when the missionaries had problems understanding what their exact role in the colonies was, colonial officials in British East Africa advised them to read a little book by Sidney Olivier, White Capital and Coloured Labour, which outlined the role of missionaries as being to soften the natives for proper exploitation by white capitalists. The work of the missionaries, therefore, was to help make the African poor by depriving him of his cultural heritage so that he could be properly controlled in order to entrench European interests. Moi seems to have understood the colonial control mechanism very well. Poverty as a controlling mechanism became the tool to be employed against those who dared to challenge his rule and a good example of this kind of thinking was explicit in the destruction of cash crops and the cooperative movement in Central Kenya. As multiparty pressure intensified with no end in sight, official Moi policy became one of isolating the Kikuyu and making them poorer while endearing himself, with jobs and food aid, to tribes he considered subservient and sympathetic to his rule. Decades later, Moi was not acting alone. Foreign interests were driving him through remote control. When political colonialism in Africa came to an end there were anxieties as well as high expectations, both outside and within the African countries. The apparent loss of political control created anxiety among the Westerners who worried about what African independence meant to the old order. 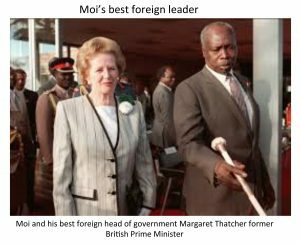 Fabled British Iron Lady Margaret Thatcher supported Dictator Moi to the hilt. Independence was then portrayed as an ideological invasion that threatened the white world and might even lead to the breakup of such institutions as the British Commonwealth of Nations. If African independence was an invasion into the existing white order, a strategy was needed to render that invasion ineffective. Making the Africans poorer in independence than they were during colonial times was the applied strategy. The Westerners concerned did not have to start from scratch in designing a mechanism for fighting the African invasion of the world order. The colonial boundaries that they had imposed arbitrarily had forced diverse peoples into single national entities in the service of colonialism and at the same time emphasized differences that colonialists stressed so as to make governance difficult for the new leaders. They deliberately imposed artificial structures that they knew would not work well. Even more important to them was the fact that the elites they handed over power to be products of the colonial education system and schooled in Western ways. Instead of pursuing indigenous models of development, almost all of them set out to construct imitation Western societies. Indeed, Moi had inherited some of the most efficient colonial elites led by his Attorney General and, later, Constitution Affairs minister Charles Mugane Njonjo, who never considered himself an African. Born in 1920, Njonjo, has had a lifelong affectation for a long-forgotten, even in Britain, British Home Counties gentleman’s sartorial style of three-piece, pinstriped suit complete with a laurel in his lapel and a pocket watch on a gold chain. This remarkable get-up on the Equator has impressed mostly gawking village idiots. Njonjo played a key role in the break up of the original East African Community in 1975. 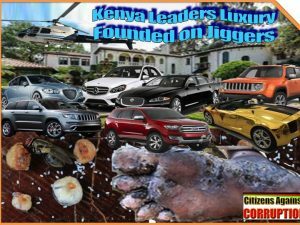 Njonjo and former head of Civil Service Jeremiah Kiereini now feature as grandfathers behind millions of shillings skimmed from Kenya taxpayers through purchases of government vehicles from Cooper Motor Corporation of which they were directors. This is but one clear example of how national pillars entrusted with the prosperity of their motherland turned looters of national coffers stunting Kenya’s growth while their counterparts in the Far East patriotically boosted the growth that developed the Economic Tigers. Moi’s other advantage, which he exploited to the full, was that he was also in the ranks of trusted Western allies during the Cold War. African independence was the culmination of a major movement in human history in which the last great area of colonial control came under local African leaders. In order to squander the national wealth and thereby create more poverty for the people in the countries that they ruled, African rulers were encouraged and assisted by Western governments and institutions in the name of development. Development, especially during the Cold War, meant pumping money to autocratic regimes that professed some sort of anticommunism. Irrespective of how atrocious and destructive a ruler was to his country and people, such a person had to be maintained through developmentalism, because it was in Western interests. 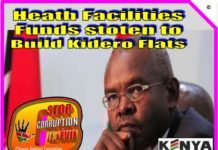 Among the supposed tools of this development were State creations called parastatals, which soon became poverty creating organs. Through parastatals, with great ability to redirect tax money taken from rural people into private pockets, public wealth and resources were siphoned and thus poverty in the respective countries intensified. And as parastatals siphoned out State resources to benefit a favoured few and create mass poverty in various African countries, they helped to create a new poverty-driven industry–the international aid institutions. The Moi regime perfected the art of looting parastatal organisations to bankruptcy and creating what was known as “Nyayo era overnight millionaires”. 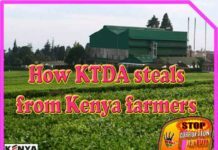 But besides entrenching poverty by preventing enterprising Kenyans from creating wealth through agricultural activities, the Moi regime paved clear avenues for foreigners and financial speculators to make a quick kill. After closing down indigenous banks, new banks were licensed with abandon, only to go under with millions of shillings in taxpayers’ cash from parastatals organizations, to say nothing about depositors’ cash. Some of the banks were also actively involved in capital flight, most of which has set up multibillion-shilling industries in the Middle East and India. Foreigners also moved in to exploit delicate ecological wetlands in parts of the country in the name of horticultural farming. Some of them would eventually be responsible for the environmental disaster now facing Lake Nakuru, with lack of water and effluents from their farms poisoning the lake. 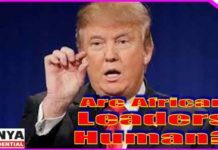 Others run around with guns hunting down Africans like wild game. Investigations into corruption during the Moi era revealed that multibillion-shilling contracts and tenders were awarded to politically-correct individuals floating the names of nonexistent firms. Most of the tenders involved the defense and security departments, where the blanket cover of “national security” was used to conceal the massive thefts of public funds. It was during the same time that the notorious Goldenberg and Anglo Leasing scandals were conceived, mid-wifed and born. Brokers in some of the deals, like Ketan Somaia serving 24-year jail term in Britain, used to globetrot between Nairobi and the Western capitals with blank international purchase orders (IPOs) through which Kenya lost billions of shillings. The notorious criminals behind these callous heists still roam the political landscape unscathed. But even within his own Rift Valley and Baringo in particular, Moi was a true student of colonial economic repression. Baringo Central, his constituency for 46 years by the time he left Parliament, was one of the least developed in Kenya. His son Gideon inherited the seat, but only for a short span of five years. 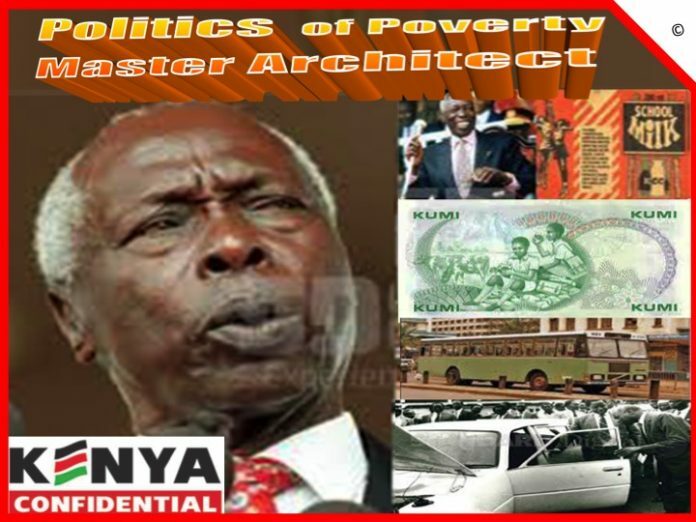 Come 2007 and all the three Moi sons, beneficiaries of overwhelming wealth who stood for election, were shown dust by an electorate that was reacting to decades of denial and impoverishment. But Kenyans have a short memory and in 2013 two of them were elected to Parliament as a Senator and a Member of Parliament. Footnote: Corruption erodes values, integrity and conscience.